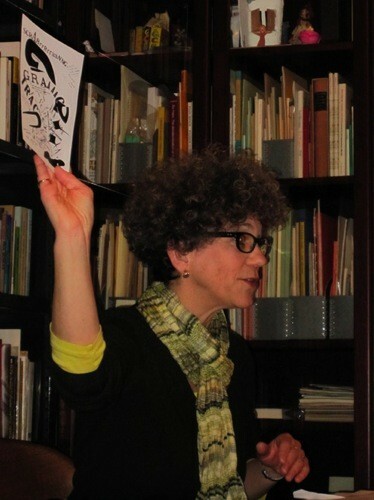 Johanna Drucker gives a talk at Steve Clay’s home. Photo by Julie Harrison. Note: On March 16, 2011, artists’ book author, publisher, and critic Johanna Drucker gave a reading/performance entitled “How Some Poems Are Made” as part of the Threads Talk Series put on by Granary Books editor Steve Clay at his apartment/publishing house in SoHo (a complete audio recording of the talk and Q&A session is available on PennSound). In her talk, Drucker examined “the relation between production means and aesthetic expression.” Afterward, poet Leo Genji Amino asked her a few questions about the very means of production that had delivered her talk, and the particular aesthetic encouraged by that delivery. Leo Genji Amino: Granary editor Steve Clay describes both the more “critical” and “creative” work of yours that he’s published as embodying much of his vision for the artists’ book as a genre that self-consciously interrogates its form. Yet Steve prefers to leave the theorizing of that vision to others, tending to describe his projects as developing by a certain intuition, or spontaneity (Charles Bernstein has described this work as a kind of “conjuring”). In a talk you recently gave for Steve’s Threads Talk Series, you presented a vocabulary that would help us consider the ways that different means of production inform the conceptual production of a given moment. What kind of vocabulary might you lend to a description of the conceptual or aesthetic tenor that has been encouraged by Granary Books, as we might conceive of this publisher as means of production and distribution? To what degree do the Granary’s interests and investigations represent or resonate with your own interests in and for the artists’ book today? Johanna Drucker: In Granary’s aesthetic, late twentieth-century fine press meets literary experiment and innovative arts. One distinctive feature of Steve’s work is its commitment to interesting literature, a connection that is sorely lacking in the work of many book artists or presses, though of course there are other exceptions. (Charles Alexander’s Chax press comes to mind, for instance.) Steve’s roots in poetry and the literary world stick out everywhere in the Granary list, and that grounds his publishing in an interesting way, especially because the works he produces in more limited editions tend to be rare events for the writers he publishes — many of whom have had their work presented in literary magazines or chapbooks or academic press publications that have more conventional design. The Granary list also includes offset editions of creative works, scholarly reference texts, alongside the more limited productions in letterpress with their hand-painting, or high-end digital prints, or specialized bindings. But it can’t be described as expressing a single aesthetic. 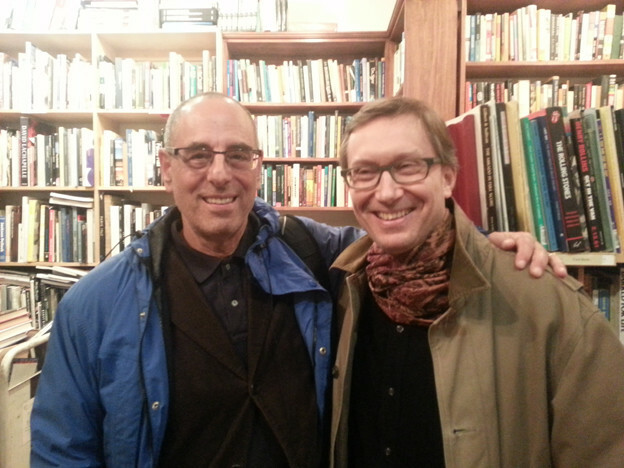 Steve’s commitment to literary experiment and book production has also been complimented by a serious engagement with visual artists, including some with substantial status in the art world. This has certainly raised the profile of the press. Artists’ books are too often created in a vacuum — in studio programs where they are isolated from mainstream currents of literary and visual art activity — and that makes them seem amateurish or hobbyist. No one starting a career as a professional artist would imagine they could begin without paying attention to the scene. So integrating these worlds is a bonus for the field as well as for Steve’s own projects. It raises the bar. Granary is also distinguished by being a press and publisher, not a platform for an individual artist, and that is another of its characteristic features. In our generation, from the 1960s through now, not many American publishers have had this specific profile. Small press and literary publishing has been consistent and persistent, with dedicated and fine people involved. We’ve also had some very long-lived artists’ books presses, some institutional, others independent. I could rattle off a list of names in both realms, but I’m afraid I would include some folks and forget others unintentionally, and that would only be unkind by oversight. But very few have combined these worlds in a substantial way, particularly in the US. My current interests in books are split. I have a scholarly/critical engagement with format, structure, and what I am calling “diagrammatic writing” (that which proceeds from format and its spatial relations as the field of semantic values). And I have a creative interest in writing various formats into the same kind of relational space. When I was in my twenties, I wrote works that had branchings, nodes, foldout statements and spatial extensions of the text. These had to be created with scotch tape and snippets of typewritten text on bond paper. I was pursuing what would come to be known as a hypertextual mode in which the points of branching were rhetorically significant. But I was also trying to understand the semantic force of organization and graphical arrangement — in other words, what were the values of the relations themselves (e.g. why juxtaposition is not the same as hierarchy). I’m still trying to do that. I’ve also had fun and made books about women, narrative, news, language, and other matters. As a critic and historian, I am interested in seeing how the scene changes. Who is doing what and what forms emerge, what ideas persist. I have my own preferences, strong preferences, and always have. But that is the role of the critic. The task of the historian is to describe, of the critic, to call attention to things you know how to value (or devalue) and make interesting to others through your discussion and description. The willingness to make decisions about what you think is important matters more in the realm of collections development where I hate seeing vapid overproduced works collected at a high price while imaginative works at a less impressive production level are overlooked. (This is not a comment aimed at Granary, by the way.) Maybe that will change. Amino: Steve explains that because he has found your work to represent Granary’s vision so well, much of his involvement in the works you’ve published with him has been at the stage of re-production and distribution, rather than at an earlier conceptual moment. You’ve written much about both the “auratic” quality of certain artists’ books that are one-of-a-kind prints, and about the myth of the artists’ book as a “democratic multiple” that is perpetuated by some widely re-produced works. In the particular mode of re-production that your works have undergone through Granary Books (this means simply a second print run for some), how have they been changed or invested (ideologically, aesthetically) by re-iteration? Drucker: Every edition of a work is a different thing, and that is just fine. I’ve been very appreciative of Steve’s willingness to make some of my books available in editions that were more numerous than the originals, or to support the reprinting of The Century of Artists’ Books, or to do A Girl’s Life with Susan Bee. I appreciate that he is willing to put a Granary imprint on something as utterly sui generis as Testament of Women, a book that resonates with a certain rarified audience, but not necessarily with others. But I think we are all aware that we are now in a moment when a varied and distributed mode of production makes sense. We make limited edition unique objects, we make digital versions and offset or print on demand output as well as gallery items within a single work because these things do not cancel each other out, but are part of a publication continuum. I think we are all exploring ways in which different versions of what we produce will work for a range of different audiences. Newer production technologies have made this much easier, especially as color printing has become so affordable and flexible. First and second editions of Johanna Drucker's The Word Made Flesh. We made various changes in the editions of Word Made Flesh and History of the/my Wor(l)d. WMF was re-photographed by Brad Freeman, using a copy camera. He made the separations and plates for printing using masking sheets — a mechanical, not a digital, technique. The covers were letterpress printed by me, a longish walk as I recall … But History was actually recomposed in its entirety on the computer, not photographed or reproduced. My friend Gino Lee found a Caslon for me that matched the beautiful font we had had at the Bow and Arrow Press at Harvard. I reset the book, scanned the images, and remade the pages. The book needed to be reduced slightly in size, and the combination of some iffy presswork and the size of the original fonts made me think we would lose legibility. So, though at first glance it looks like a facsimile, examination quickly reveals it is not. I’ve never loved the covers on that second edition, the paper wasn’t right and I’m not sure why I went with it. I know we had a reason at the time, but I see now that my judgment was faulty. First and second editions of Johanna Drucker's History of the/my Wor(l)d.
Amino: Of course, Granary has been much more than a means of production or a publication technology to the artists it has promoted. In fact, Steve describes his work as principally a kind of “midwifery” to the works of these artists. What do you think of this metaphor? You've written much of the way that a material, embodied history (and contemporary practice) of writing is often neglected in favor of a notion of language as a benign canvas for the display of a consumption-ready “content.” Does Steve’s metaphor of publisher as a nurturing, delivering agent point to an alternative history and practice of publishing that is concerned with cultivating relationships between poets and editors, and interrogating the relationship between the conceptual and the material moments of publication? What relevance does an investment in this kind of community and conversation have for your own publication ventures? Drucker: I think Steve has brought many books into the world, and so the metaphor is apt. In that capacity he continues the tradition of Daniel Kahnweiler, Ambrose Vollard, and Albert Skira, among others. But my sense is that he coordinates production rather than directing it. Ilizad, by contrast, really designed the works he produced, creating elaborately formatted maquettes by which he structured the books as a whole. In designing Maximiliana (1964), for instance, he required Max Ernst to make a certain number of blocks of glyphic writing at a particular size, shape, dimension and so on. Steve works with artists he trusts and lets them do what they want to do. I think he determines the basic production parameters, but lets the intertextual development, techniques, contents, expression, media, and other elements develop as the artists’ vision. Some of the artists are more attentive to features of the codex than others. Some see sequence, juxtaposition, development, openings, and the interplay of elements in a more self-reflexive way. Others use the book as a way to explore an idea or project using the book as a fairly unobtrusive medium. It would be tedious to have every book be self-consciously self-referential. The book arts community has grown over the last decades, and Codex, the book fairs, and other venues where publishers, printers, and artists gather provide an increasingly vital and generative space of exchange. When I was first making books, in the early 1970s, we hardly knew the term artists’ books, but we were working in print shops where poets and artists were crossing paths. Being around other people working in the same studios, watching their projects develop, seeing how they think something through is exciting. Collaborating does some of that as well. We still need more conversations about books, including more good critical writing — not just about themes or production values, but about ways of thinking. All good art is an expression of thought, but how thought form works — that is what we need to be able to articulate. If I have a disappointment with the people in the book arts world, it is that they have been eager to follow the usual art world self-promotional approach to criticism rather than an interrogative engagement with historically informed understanding. People see what’s around them, look for opportunity. But do they pull back, ask what else they might see and know and bring into the conversation from out of sight? The produce-and-consume cycle has accelerated, which I think makes folks anxious for their own celebrity, rather than their own development. And yet, every time I go to Codex I find something remarkable, engaging, substantial, that feeds my own thought and work. More people are doing more interesting things and we are learning from each other, but at the same time, as in all fields, much is being produced that is not that interesting. Knowing the difference is the challenge. Amino: You’ve written about the way that the increasing digitization of publishing practices works to erase this material history we’ve just spoken about, and you’ve investigated the different practices of reading and writing that are emerging as the written word approaches “immateriality,” as environments for its display become more dynamic. In this climate, how do we begin to think differently about the way that publication and distribution practices inform an artwork? In a talk that he recently gave at the In(ter)ventions residency at the Banff center in Alberta, Canada, Darren Wershler introduced his concept of the digital literary work as “findable,” as an object that can only be understood in light of its situation at a particular cross section of increasingly complex networks. What ethical and aesthetic concerns must a publisher encounter today as it considers circulation within and across new networks? Drucker: If I ever suggested we are going in an “immaterial” direction, I’d like to correct that. Two great myths persist about digital media — that they are immaterial and that they are permanent. Neither is true. Digital activity depends on the most elaborate material platform we’ve ever devised for production! Every migration of a file to another changes it, and bit rot sets in almost as soon as a file is made. But I do think a very interesting tension exists between the myth of immateriality and the reinvestigation of material practices in our time. Not by accident has there been a revival of intense interest in materialities of all sorts, though oddly, even these persons are often quasi-amnesiac about the long history of this concept. Aristotle is one important source of theoretical engagement with the notion, which he associated with mater, mother, which comes from the same root. I know this through the writings of medievalists who look at the way materiality was understood within religious practices and icons. They have tracked beliefs about matter — which has a strong place in debates about faith — back to antiquity. The idea of distributed platforms, works that exist iteratively, have different expressions in different media, is also part of that materiality. Historically, that has also been true for a long time and in many places. Drama and music depend upon performance and they are old forms, always iterative. In the digital environment, the “findable” aspects of new projects extend, rather than invent, their situatedness. We know there are precedents for the use of media to promote projects across placards, advertising hoardings, and other advance notices. We also know that the publication of mainstream works took many forms in earlier eras. Iterativity is not unique to our times, even if some of its details are. In fact, Darren and his wife Sandra Gabriele are both keenly engaged in interesting historical and theoretical research in this area. Johanna Drucker talk at Steve Clay’s home. Photo by Julie Harrison. Amino: In The Century of Artists’ Books, you assert that a defining characteristic of the artist’s book is that it “interrogates the conceptual and material form of the book as part of its intentions, thematic interests, [and] production activities.” In Sweet Dreams, you make a distinction between the notion of self-conscious aestheticism that characterized much of postmodern work (one aspiring to what you call an “aloof separation” of the aesthetic from economies of power) and an idea of “self-conscious artifice” that strikes you as ethically appropriate today (one in which the aesthetic recognizes its complicity in the construction of these economies). As an art form that is strongly identified by a self-consciousness about its own material and conceptual form, what is the place of the artists’ book in this engagement with complicity that you believe to be so important today? Drucker: As I said above, it would be tedious if every artist’s book were a “self-conscious codex.” But any aesthetic work makes an argument about what it believes its own form to be. If you write a novel, you are making assumptions about what you think a novel is — and those assumptions, wittingly or not, are part of the longer, historical and theoretical, arguments about “novel-ness” — to use an ugly term. The production values and the conception values — the made thing and the thought thing — are equal partners in that argument. Any work of contemporary art can be made with some degree of awareness of this fact without having to make its self-consciousness the center of its subject, theme, or production. I wouldn’t want to read an endless number of highly contrived or overworked, graphically complex, spatially intricate, or otherwise excessively “artificed” works unless they were made in that way to demonstrate or embody an idea. But to pretend we don’t know that we are making work on top of a history of other works, or that whatever we make is in dialogue with the current world of entertainment culture and its massive industries, is simply naïve. Likewise, the continuation of what we might call “the modern ideology” — the ideas that came out of the utopian impulses of nineteenth-century romanticism and then the twentieth-century avant-garde — is also naïve. To imagine that art is outside of or above ideology, that making art allows one to take a morally superior position to the culture, to act as if we are not part of an industry ourselves, that we don’t seek the rewards set by the system whose values we claim to eschew, is also naïve. We are in the world and of it, not outside. What is the role of art in our culture? Again, we inherit the modern ideology in the phrase, “the point is to change it,” which comes from political philosophy. Politics is essential, it is about change — about trying to set the broken world right and align it with whatever values you believe. But didacticism and elitist obscurantism in the arts posing as politics? That’s reprehensible and trivializing. When I say we are complicit, it is a reaction against the hypocrisy rampant in the academy and art world in which the old stamp of the avant-garde validates the “resistant” strain of work as if it were a politics. Expose the world, be in the world, make a space for thought, experience, engagement — produce the work of the immanent sublime. The term artifice merely introduces a sign of such self-consciousness — that the work is made to be made, to show its made-ness as an argument about aesthetic expressions in their distinction from other things. Amino: In the essay you wrote with Jerome McGann, “Images as the Text,” you sketch out two reciprocal rhetorics of transparency often invoked in readings of both text and image. You explain that in typical textual reading, “[t]he physicality of textual marks and shapes disappear in an act of reading determined to highlight certain kinds of conceptual references (content),” whereas in typical readings of an image, “a powerful figurative gestalt (or figurative reference) stands imperiously before us, hiding the methodical procedures by which the image’s ideas or arguments are being developed — as if the graphic character of the work were completely obvious.” Much of your work plays word and image against one another in configurations that resist these rhetorics of transparency, which would transform the articulations of reading into an enterprise of mere decoding. How must this question of alternative reading practices be approached differently by today’s publishers of both digital and analog media? Drucker: I pay attention to the word/image tension because I am a graphic artist, and so the visual world is what I know. But temporal and spatial dimensions factor into book space. Now audio and video are ubiquitous in digital artifacts, so we have to process multiple types of signals at the same time — not necessarily in an integrated mode, as in a film or opera, but in a dis-jointed but simultaneously present set of stimuli. That intensifies the tensions at work in a simple word/image juxtaposition and its demands. Modes of reading and processing have exceeded our book space environment, but, at the same time, I think that we have learned an enormous amount about books and their structured features — the configured organization of navigation, presentation, reference, use etc. — as a result. Artists continue to engage in imaginative rethinkings of these spatial sequences and to call our attention to acts of reading as production. The rate at which certain features of the digital environment became standardized into conventions that almost disappear now, so familiar they have become, is astonishing. One experience worth having is to revisit some of the first generation of electronic arts and literary works and to see how their interface structures worked in that incunabula period. Many imaginative works and nonstandard solutions were devised. This used to seem annoying. Now it seems charming, intriguing, like looking at woodcuts of the natural world in a period before realist representations were set strongly in place. Publishers in any media have the same task — to bring imaginative and aesthetically interesting work into the world. Our human capacity to know, think, understand, process cognitively, depends more than we realize on what I call the hand’s mind, the physicality of being in the world. Alphanumeric inscription may go away in our lifetimes, replaced by immersive media — images, verbal texts, sound, music, movement, form. Ironically, that same notational system is essential to coding, programming, and computational media. But the rhetorical force of materiality will be part of artistic production even when we are stimulating nerve centers with chips and signals to disturb the quiescent force fields of the brain and provide the satisfying drug of aesthetic pleasure to those zones.